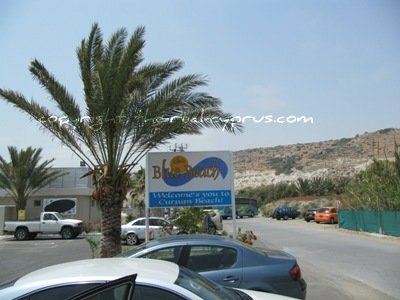 Chris Blue Beach Taverna has been serving holiday makers on curium beach for at least 25 years. 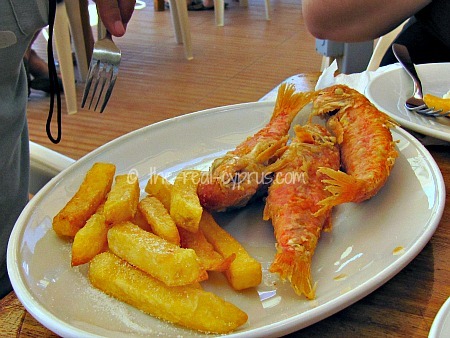 Their family restaurant has undergone a major renovation in the last few years and is a very stylish place in a great beachside location and you will definately find something on the menu to tempt you. 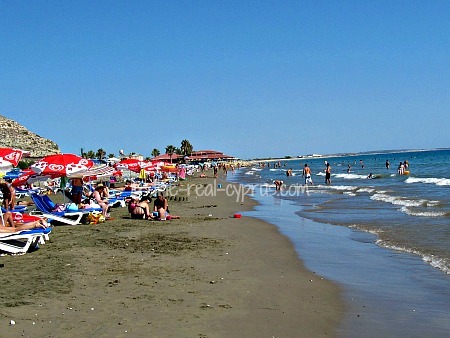 It is our most favourite taverna when we are using this beach close to Limassol. If you are visiting the kourion/curium amphitheatre and mosaics then you cannot miss a trip here for lunch or dinner. You can see the restaurant on the beach from your vantage point at the ruins so you know you don't have very far to travel. During the summer months they are open till late and you can and enjoy watching the sun go down over Episkopi Bay. 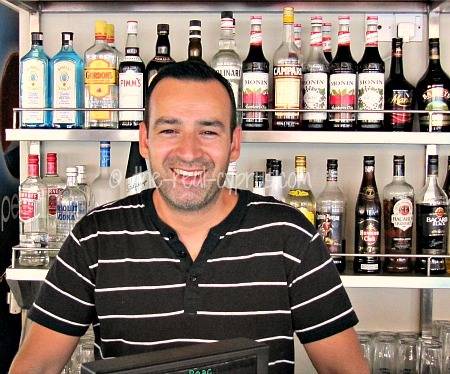 There is a wide choice of food on the menu at Chris Blue Beach Taverna, from a simple salad to a full umpteen course meze, all freshly made before being brought to your table by one of the friendly waiting staff that have worked for Chris for years. Chris has run the restaurant for a long time now and we remember the children running around when they were small. Now they are adults, Marina, Efthimious and Savvas still help out their father during the busy summer months at the beach. They are a wonderful family and have a brilliant aptitude for remembering who you are, even if they have not seen you for years. They have a very loyal clientele who come back year after year because the food is fresh and the service is great and they make you feel welcome. Marina now is all grown up and is not that little girl anymore and she always has a happy smiling face when she sees you. 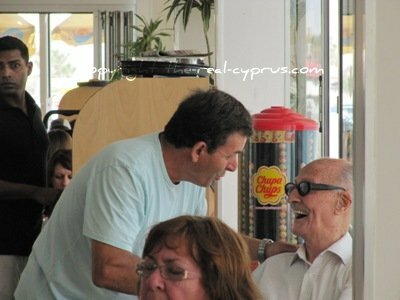 Efthimios is the joker in the family and he will greet you with a smile and always have something funny to say. You can see here that the restaurant is popular and very, very busy during the summer months, and incredibly so at the weekend. 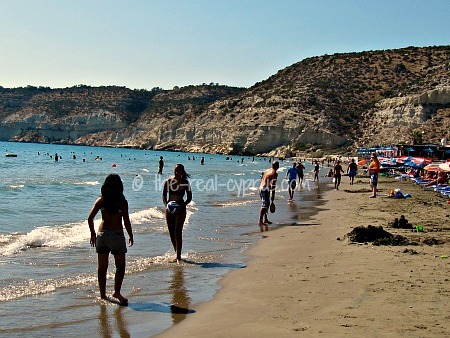 These pictures show both ends of the beach, it is quite a long one with Chris Blue Beach in the middle of the 3 tavernas. 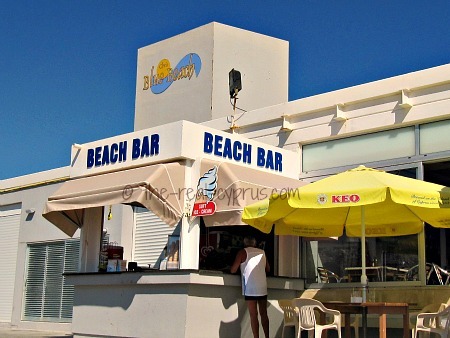 They have a great beach bar, if you just want to get drinks without having to feel like you have to get dressed and go inside, or you can move to the outside patio which envelopes 2 sides of the restaurant and has plenty of shade whilst eating. 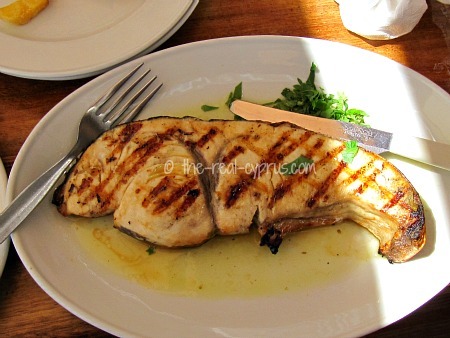 Some typical food is swordfish and snapper and on this day we also had moussaka. Whatever you choose, the food is excellent! Expensive but excellent and the portions are extremely good. 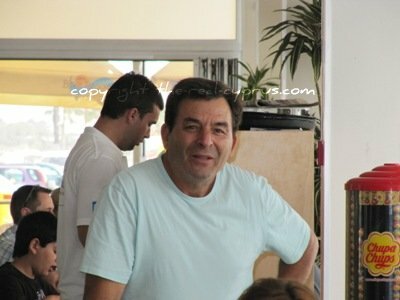 If you want to come for sunday lunch get here by 12.00 or you won't get a seat at all, Chris Blue Beach Taverna is a hit with everyone and the locals come out in droves, because it is a great family destination by the sea. What more could you ask for and if you like fish, they have a wonderful selection for you to choose from? (00357) 99515391 it is a mobile as no phone lines to the beach! 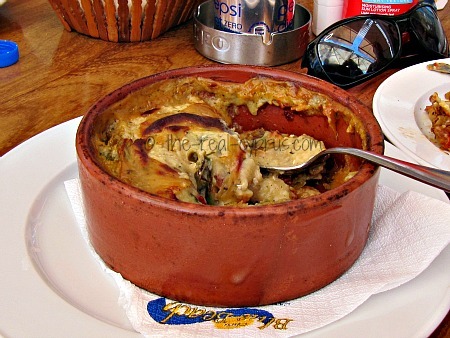 Tell us about your visit and share your photographs about Chris Blue Beach Taverna, why you like to go, what is your favourite meal, how long have you been going, that sort of thing...!